The dome of Saint Peter’s Basilica is the dominant feature of the Roman skyline. Designed by Michelangelo, the dome was actually carried out by his successors as architects of Saint Peters; Domenico Fontana and Giacomo Della Porta. They completed the building in three years, by 1590. The interior decorations of the dome were designed by Cavalier D’Arpino, Giuseppe Cesari, between 1603 and 1612. Their sketches were made in to mosaics by Cesare Torelli, Donato Parigi, Ranuccio Semprevivo and Rosario Parasole. These mosaics show Jesus, Mary, Joseph, John the Baptist and the 12 apostles the Church is happy with shooting up via angels to God, who is depicted in the Cupola or smaller dome at the very top. At the base of the cupola is inscribed: S. PETRI GLORIAE SIXTUS PP. V.A. MDXC PONTIF. V., or for the glory of Saint Peter, Pope Sixtus the fifth 1590, the fifth year of his pontificate. He commissioned the dome and it was finished the year he passed away. “You are Peter, the rock, upon this rock I build my Church, I will give you the keys to the Kingdom of Heaven”. This drum section was the part of the dome completed by Michelangelo in his lifetime although he never saw it decorated. The Catholic Church regards this statement from Jesus as making Peter the first Pope, papa or father of the church. The Popes regard themselves as the successors to his office as Bishop of Rome; the earthly head of the Roman Catholic Church; they have always regarded Jesus as the head of the Church. and St. Mark with the lion. These four men, or the gospels later ascribed to these men by Irenaeus, give us the majority of information about the life of Jesus. Other gospels exist, but these are considered authentic by the vast majority Christian Churches. They were also the first four written. Structurally, the dome is 150 metres or 490 feet high from the floor to the cross on top of the dome. The Statue of Liberty could fit inside St. Peter’s underneath the dome and there would still be almost 220 feet to spare. Visiting the dome affords the visitor great views of the inside of the church and of the outside of Rome. A small charge, less than €10, is incurred. 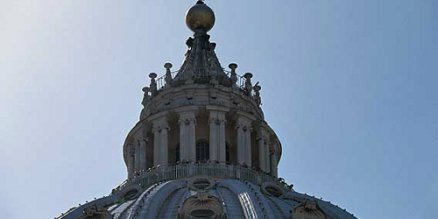 You can visit the dome of st. peters by lining up in St. Peter’s Square and once you reach the portico of the church, taking a right to the dome ticket office. Alternatively if you do the museums and chapel, once you exit the chapel you will see the line for the dome beneath you. Vatican Tour Dara was Great! skipping the lines is a BIG DEAL! vatican has too many visitors. Would recommend this tour. Dara was great. I don’t know how people go to the Vatican without a guided tour. There is no other way of doing it. Our guide was incredibly informed and very intelligent. I learnt so much with this tour! He was amazing and there is no complaint to be made. On a scale from 1 to 10 (10 being the highest), he ranks at a 10+. 🙂 Thank you for making our Vatican tour the best! Dara was excellent I thoroughly enjoyed the tour as did my family. I would do it again when I return. Dara’s knowledge was superb and was able to make the information very enjoyable. Hearing some other guides as we went round, his knowledge and expertise was a lot better and without this I think we would have skipped through a lot of the Museums and just gone to the Sistine Chapel as it was so busy.